We invite you to join us as we share about our Beloved Creator, Redeemer, the good news of His salvation, His love, His instructions for this life, and the promise of eternal life in Heaven, the City He prepared as our eternal Home. It's all in the Bible, the love letter He wrote for us. You can watch a video of our dad, Oden Hetrick, taking you on a tour thru heaven. We have THE EXPANDED Edition of Dad's Book titled "Inside The Gates of Heaven" available. You can read part one, about dad’s many visits to heaven, on the Read page. Part two, with testimonies of the family, and part three, with end-time events, cannot be read on this website but they are available in the book that you can order. 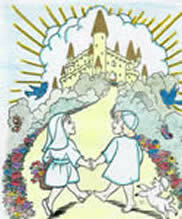 We also have a book to offer, written by Oden's daughter Joyful Star, titled “Heaven and the Gracious King”! The Order Page is for you to see if there is anything you would like to have for your very own. And on the Contact Page, you will find some of YOUR QUESTIONS ANSWERED. So Many People Ask — What Do We Do In Heaven? Isaiah 32:17,18 righteous people dwell in a peaceable habitation, and in sure dwellings, and in quiet resting places. John 4:13, 14 Jesus said the water He gives will be a well of water springing up into everlasting life. Psalm 36:8, 9 We will be abundantly satisfied (filled), drink from the river of pleasure, and in His light we will see light. Psalm 37:4 Delight yourself in Jehovah; and He shall give you the desires of your heart. Psalm 65:4 Blessed is the man whom You choose, and cause to approach to you, that he may dwell in Your courts, and be satisfied with the goodness of Your holy temple. Psalm 84:1-2 How beautiful are your tabernacles, O Jehovah of hosts! Psalm 92:12 Those who are planted in the house of the LORD shall flourish in the courts of our God. Luke 6:21 Those who weep now shall laugh. Isaiah 54:11-12 O you who are afflicted, and not comforted, behold, I will lay your stones with fair colors, and lay your foundation with sapphires, I will make your windows of agates, and all your borders of pleasant stones. John 14:2, 3 (Yeshua said) In my Father's house are many mansions, I go to prepare a place for you .... and I will come again, and receive you to myself, that where I am, there you may be also. Revelation 21:18, 19 (what John saw) And the wall was of jasper: and the city was pure gold, like clear glass, and the foundations of the city were garnished with all manner of precious stones. Revelation 21:21 And the twelve gates were each one pearl, the street of the city was pure gold, like transparent glass. And speaking of beauty! ....... If You Would Like --- You may read an excerpt from the book "Heavenly City and Gracious King" about the garden of fountains! Just go to the About page!!! THE GREATEST LOVE STORY ever told is about a King who left His beautiful castle and went to the prison house where His bride-to-be was being held captive by a great red dragon. The battle was fierce and blood was spilled by the King, but He wounded the great red dragon. By and by the King returned. This time He brought His army with Him to fight with the dragon, while he rescued His beloved, and took her with Him back to His castle. The King is Jesus, the Divine Son of God Most high. The castle is the City of God in the sky. The great red dragon is satan, the devil. The prison house is the world. The army is the host of angels. The bride-to-be is the true Church, the saints of God. 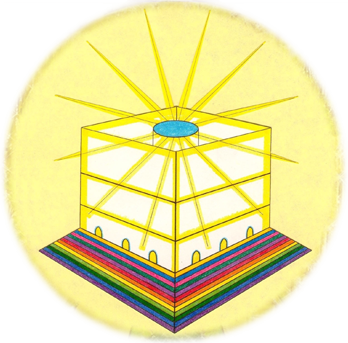 This true story began in the courts of a beautiful golden City of God, the castle beyond space, where Yeshua/Jesus, the King laid aside His royal robes and began His descent to earth, the prison house, to live in a mortal body. One dark night a band of men and officers from the religious leaders came with lanterns and weapons to find Jesus. One of His own disciples, inspired by satan, led the band to Him. He betrayed with a kiss the One who was sent to save him. So they bound Jesus like a criminal and led Him to the High Priest. He was questioned by Caiaphas, and questioned by Pilate who also ordered Him to be scourged. The soldiers thrust a crown of sharp thorns down on his head, they hit him, spit on him and mocked Him. In all of this Jesus did not defend himself nor speak. So dealing with the forces of darkness and destruction as well as the heavy responsibility for the sins and sorrows of mankind He was led away to be crucified. They pierced His hands and His feet with nails and placed Him on a cross between two thieves, and there was darkness over the land for 3 hours. After having been nailed to the cross, Jesus cried out, “Father, forgive them, because they do not know what they are doing.” What great love-He was praying for those who tortured Him. Finally He said, “It is finished” and bowed his head and died. His friends (part of His bride-to-be) laid His body in a new tomb. Now the best part of the story is what happened on the third day. There was an earthquake, a bright angel that looked like lightning rolled away the stone from the tomb, so everyone could see it was empty. Death could have no power over the Giver of Life. The King had triumphed over the great red dragon! Jesus had risen triumphant over sin and death!! He is alive today having paid the price for your sin, because He loves you. To all who will receive Him, He will give power to become the sons of God. Where they live Joyfully ever after! !